When Eve gets the news that her sister is in hospital after a vicious attack and may not ever fully recover she thinks things can’t get any worse. Then Rosie dies and six months later the pain is still there, ever present. Anthony thinks a night out will get him away from his mums awful, abusive boyfriend. Its meant to get him out of the house and have a little fun. Instead six months on that night is seared into his brain and he will never forget it – especially as he knows he could have done something about it. The two of them have experienced true horror and now, just after they meet. They will experience it again. When I found out that Alan Gibbons, an author who I know to have taken so many real experiences to fictionalise them and provide readers with access to the truth, even when it is hard, was writing a book inspired by the death of Sophie Lancaster I knew I had to read it. I know he would handle it well and I am so glad this came from a well known author who has the talent to pull off a story like this, I knew it would be one to read and I am so glad I have, no matter how hard it was. The death of Sophie Lancaster was terrible and horrible for all those who knew her and for those of us (I say us because at the time I was very alternative myself) who didn’t but who were part of a subculture associated with her. She was a goth and she was beaten to death in a park in August of 2007 for being a Goth. The term ‘hate crime’ is used to describe that kind of thing where the police and courts are concerned and that is one of the many reasons that this books title worked so well. You have the Hate which comes from the boys who kill Rosie, and those who are involved in something else later on. 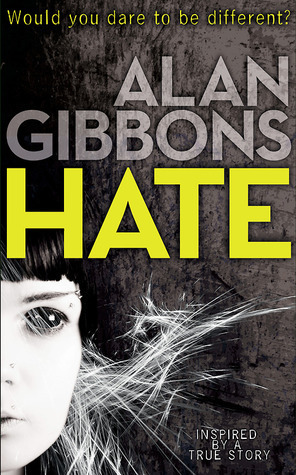 You have the hate Eve feels towards all of the people involved, including Anthony, and you have the feelings, the mixed up crazy emotions within this book which really make you think about the state of the world we live in and just how awful people can be. This book was not easy to read and I think the way it was presented was the best thing about it. As a reader you are taken backwards and forwards over a period of 6 months and told different things from different perspectives. You have Eve’s, Anthony’s and Jess’s, who is Eve’s best friend. The books split up into parts, mainly focussing on one day per part, but will have different chapters in those parts told by the different characters. Jess doesn’t feature as much as the others but I liked that she was included especially as she is a big part of Eve’s life and has certain things going on herself. Because of the different points of view and the changing of dates, skipping between the past and present you are greeted with a short snippet of information about that character and what they have been through which helps break down the really heavy parts of this book, for which there are many. The change in point of view made me get into the head space of all these main characters and I think you needed that, especially with Anthony. It also allowed you to get to know those characters better within what is actually quite a short book. The things that happen in Hate are truly awful and therefore I cannot describe the story as good, or brilliant or anything with positive connotations because I feel so strongly about its topics and I don’t think any of them are good. One thing is for certain though, Hate needs to be read. It needs to be read to help those who can be victims understand they are not alone and they need to seek help if they are put in certain situations. It needs to be read by narrow minded people who assume that anyone different to them in any way is less deserving than them and it needs to be read by people who are oblivious to the terrors that do happen in our world, because they are there and you need to understand that walking on by is not the best reaction to certain things that happen. Hate really did stir up some heavy feelings with me. I nearly cried on the train into Manchester reading it because of how close to home it was, and I really hated to hear what happened with Rosie. The thing with Oli was so done really well but I feared for him so much, and no one should have to hide who they are just out of fear of everyone else. I loved this book but hated it too and even so I think everyone should read it – no matter how hard it is to do so! Hate was published on April 10th by Indigo. My copy was sent to me from the publisher in exchange for an honest review.